Yellow color seasonal fruits, yellow color sweets and food items are the favorite offering to Lord Vishnu in Hindu religion. Here are the benefits of offering Banana to Lord Vishnu and how to make the offering banana offering to Srihari Vishnu. It is an important offering to Vishnu for good health. Those facing severe health issues should offer Banana to Lord Vishnu on every Thursdays and during Ekadasi (11th day of a fortnight). It is offered to face controversies strongly and to overcome scandals. It is offered to escape from accidents and from damage due to bad weather. Banana is offered for success in professional life. It is also offered to get a job at the earliest. Offering of yellow color banana is done for success in education and interviews. It is offered for peace and prosperity in the family. How to Make Banana Offering to Vishnu? It should be offered on Thursday and during the eleventh day of a fortnight, (Ekadasi is dedicated to Lord Vishnu). The offered Banana or bananas should be offered to a cow. The puja is to be performed facing north. Keep a picture of Bhagavan Vishnu atop a yellow color cloth. Agarbhatti or dhoop should be of chandan. White and yellow color flowers should be offered. Yellow chandan or normal chandan should be offered and worn on the forehead. Yellow color banana should be offered. 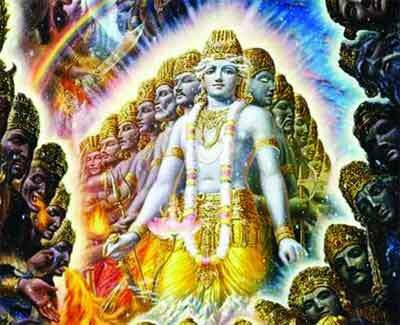 Then chant the mantra “Om Namo Narayanaya” 108 times. Kadali Pazham - a special kind of small plantain is an important offering to Lord Vishnu in the world famous Sri Guruvayoor Temple in Kerala. In Guruvayoor Temple, people also perform Thulabharam ritual using Banana.